The use of biomedia in art can be characterized by an oscillation between an immediate presence, and a complex hyper-mediated construction of underlying meaning. Biological objects, subjects or processes are staged in their apparent aliveness, prompting the viewers’ feeling that mediality has disappeared, while, in turn, this very illusionism is being unmasked and its principles made apparent. This often takes place thanks to a strategy dubbed remediation, according to Bolter and Grusin’s definition of a medium as that “which remediates and refashions older media in the name of the real.” Biotechnological artworks therefore often employ three functional features that historically granted “authenticity”: the hyperreal (artistic representation, which is extremely realistic in detail), the ephemeral (expression lasting for a very short time) and the indexical (expression whose meaning is dependent on the context in which it is used). Contemporary artworks using biotechnologies as their medium by Jun Takita, Paul Vanouse, Orlan and Tissue Culture and Art project are subjected to a transhistorical analysis leading from Still Life and Vanitas, the imprint and photography as ‘the pencil of nature’ to today’s gel electrophoresis and ‘genetic fingerprints’. 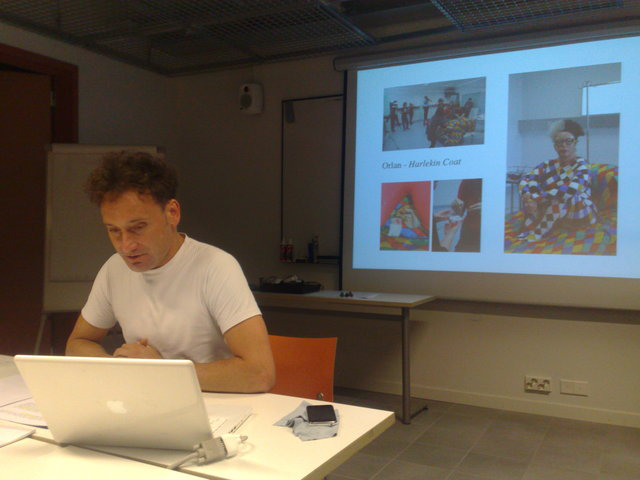 Jens Hauser is a Paris-based curator, author and arts and culture critic. He presented his current research where he investigates the paradigm bio-mediality through contemporary artworks using biotechnologies as their medium. Artworks by Jun Takita, Paul Vanouse, Orlan and Tissue Culture and Art project were subjected to a transhistorical analysis, leading from Still Life and Vanitas, the imprint and photography as “the pencil of nature”, to today’s gel electrophoresis and “genetic fingerprints”.